Grief and mourning, or joy in the morning? Yesterday morning when we read this portion in 1st Samuel, I found myself overwhelmed with grief for some reason, and could only weep and pray. And each it came to mind throughout the day I found myself deeply affected by it again. Although I don't understand it very clearly, I felt I should share it with you as fuel for prayer. After King Saul disobeyed God's instructions to completely destroy the Amalekites and their livestock, God sent Samuel to him with this message in 1 Samuel 15:22-23. "Behold, to obey is better than sacrifice, and to heed than the fat of rams... Because you have rejected the word of the Lord, He also has rejected you from being king." In spite of Saul's plea for another chance, in verses 26-28 Samuel told him, "I will not return with you, for you have rejected the word of the Lord, and the Lord has rejected you from being king over Israel. 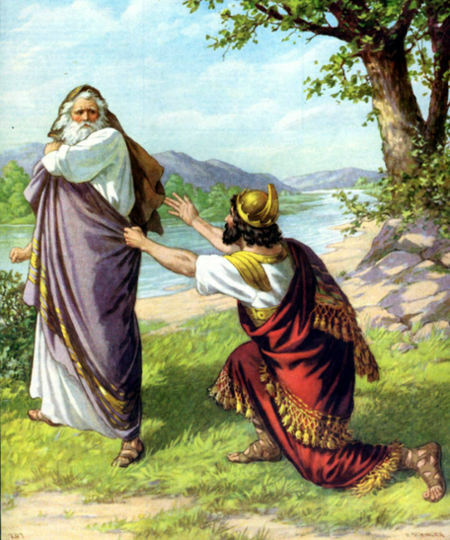 As Samuel turned to leave, Saul caught hold of the hem of his robe, and it tore. So Samuel said to him, 'The Lord has torn the kingdom of Israel from you today...'"
The chapter ends with verse 35, "And Samuel went no more to see Saul until the day of his death. Nevertheless Samuel mourned for Saul, and the Lord regretted that He had made Saul king over Israel." And then the very next verse in chapter 16 says, "Now the Lord said to Samuel, 'How long will you mourn for Saul, seeing I have rejected him from reigning over Israel?'" In a historical sense, I have found this grief applies quite clearly to Israel as a people in a similar way to to Saul as an individual. Time and again throughout their history they turned their backs on God. For the most part they ignored the prophets He sent to them. And when God sent His own son, John 1:10-11 says of Jesus, "He was in the world, and the world was made through Him, and the world did not know Him. He came to His own, and His own did not receive Him." And then on a broader scale I felt this grief and mourning as concerning the body of Christ, both past and present. How many times has the church left obedience to the clear mandates of Jesus and the other New Testament teachings unfulfilled for the sake of personal security or comfort? Not unlike Saul and people who spared "the best of all that was good" rather than obey God, being a Christian has become a matter of a few hours per week at best rather than a lifestyle of surrender and living sacrifice. Our impact on the world around us today is negligible. In the days of the early church in Acts 17 we read of Christians "turning the world upside down". But in today's "civilized" world we have backpedaled on God's commandments and moral absolutes, kowtowed to the idol of "political correctness", and have become flavorless salt and light that can't manage to shine through the cloud cover like today's Welsh sun. These are the main things that have been breaking my heart since yesterday morning. But then God tells Samuel, "OK, enough is enough, get on with it then, there is a future!" So my understanding is still vague. There seems to be a place of divine tension - balance between godly sorrow and the joy of the Lord; carrying a burden to the cross and then laying it down; weeping that lasts the nighttime and then joy that comes in the morning. This is another room in the house of prayer. On a lighter note, both Monday and yesterday were also filled with the spontaneous and wonderful fellowship of the saints! First were three visitors from Zimbabwe. 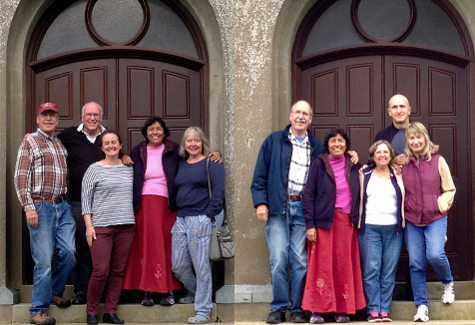 We are prayer friends with the couple on the right who live in nearby Fishguard and have been in the UK about 12 years. Their old friend was visiting them from Australia. And then yesterday the couple on the left next to me were visiting our mutual friend in Tenby from their home Northeast England. He is American but has been in England as a missionary and pastor for about 30 years. So the international flavor of people that come to visit and pray with us continues. 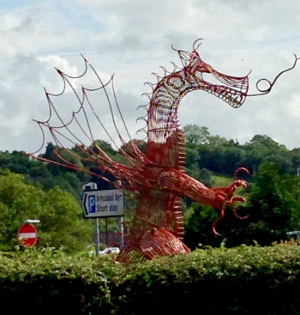 Declarations and dragons - "Greater is He..."
Today we visited Carmarthen, the largest town near us, about 25 miles south of our home. 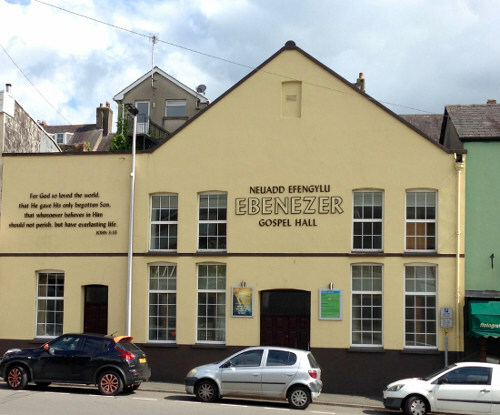 While waiting for our return bus, I noticed the Ebenezer Gospel Hall just across the street. How refreshing to see a very clear Gospel message in such a public place. The well known verse from John 3:16 is there for all to see. "For God so loved the world that He gave His only begotten Son, that whoever believes in Him should not perish but have everlasting life." The name Ebenezer is a wonderful declaration of God's faithfulness. After a victory over the Philistines in 1 Samuel 7:12, we read that "Samuel took a stone and set it up between Mizpah and Shen, and called its name Ebenezer, saying, 'Thus far the Lord has helped us.'" And in each of our own lives we can see how day by day and year by year He sustains us. As David says in Psalm 63:8, "My soul follows close behind You; Your right hand upholds me." Looking from there just off to the right is this sculpture of a Welsh dragon, as if to remind us that as followers of Jesus we all will still have battles and trials ahead of us. As long as we keep our hearts set on going God's ways rather than our own, there will still be some opposition and difficulties. But we can rest in the words of 1 John 4:4 that, "You are of God, little children, and have overcome them, because He who is in you is greater than he who is in the world." And Jesus taught His disciples in John 16:33, "These things I have spoken to you, that in Me you may have peace. In the world you will have tribulation; but be of good cheer, I have overcome the world." Last weekend we enjoyed a short visit from our friend Elitia from Singapore. We first met her at the inauguration of the newly restored Pisgah Chapel last May and the Lord has blessed us with a sweet relationship. She has taken to us as a spiritual mother and father, and honors us with her openness and trust. 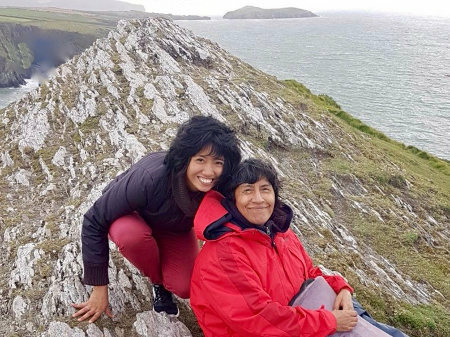 The Lord has led her come to Wales next month for a masters program and to set up an English language school for international university students. That will provide many opportunities to share the Good News. Please help us pray that God's guidance will be strong and clear for her in this big step of faith, and next phase of her life as she comes into this nation in God's service. Thank you for your continued prayers for us and for Wales. We pray you be strengthened day by day, and may His right hand uphold you. We've had another blessing this past week with a group of students from Iris Ministries Harvest School of Missions. After about 2 months in Mozambique with several hundred students, they break into small groups and go all over the world. 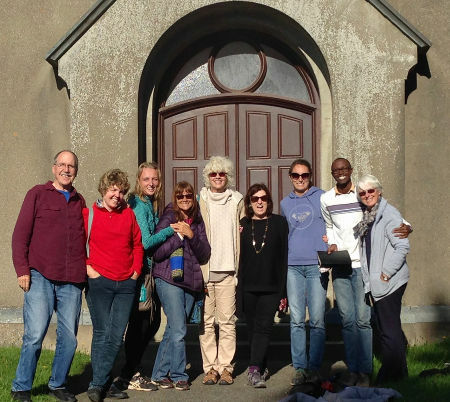 This group came with their team leader, Jackie, for a final week here in Wales. They stayed in our friends Stan and Sue's house next door, and it was a real blessing to see this beautiful property engaged directly in housing God's people for worship, training and prayer. We were privileged to spend a few awesome times of prayer with them in the midst of their very full schedule. As with the group from Singapore ten days ago, we took them to the "bend me" chapel at Blaenannerch. I shared about the early history of the 1904/05 Welsh revival, and then we spent some time to pray, and just soak in the presence of God. Then after lunch we came to Cilfowyr for another very moving time of intercession there. And now we have three more flags from Australia, Burundi and Scotland added to our collection. So we remember to pray for these nations, and we know people from there are now praying for Wales too. It is always a blessing to pray together with other people. There are so many areas of need to pray for, and large general prayers are important. But when we pray with others, the Lord always gives different ones a specific point that then we can all focus our prayers on, and it is powerful indeed. These reinforcements from time to time are a great blessing and encouragement for us. 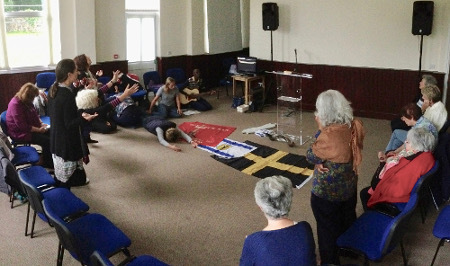 On Friday we accompanied them to Swansea for a weekly group that meets to pray specifically for Israel. After an initial time of worship, led by Claude from Burundi, our friend Elaine Price who leads the group gave an overview of the importance of prayer for Israel for the Harvest students. We then we a marvelous time praying for and blessing Israel. Joining in with a group of very dedicated intercessors who have been praying earnestly for The Holy Land for years was a great experience for us all. Then in my reading and prayer on Saturday morning this section from Jeremiah 24:6-7 really stirred my heart. "For I will set My eyes on them for good, and I will bring them back to this land; I will build them and not pull them down, and I will plant them and not pluck them up. Then I will give them a heart to know Me, that I am the Lord; and they shall be My people, and I will be their God, for they shall return to Me with their whole heart." We see God's wonderful promise fulfilled in part, but how we long to see all of Israel have "a heart to know Me, that I am the Lord." This is also our prayer for Wales, for the churches here, and the body of Christ throughout the world. May this also our own prayer for our lives and yours, to have our hearts refreshed daily with hunger to know more of His amazing love and grace to share with those around us. "That the nations may tremble at Your presence!" 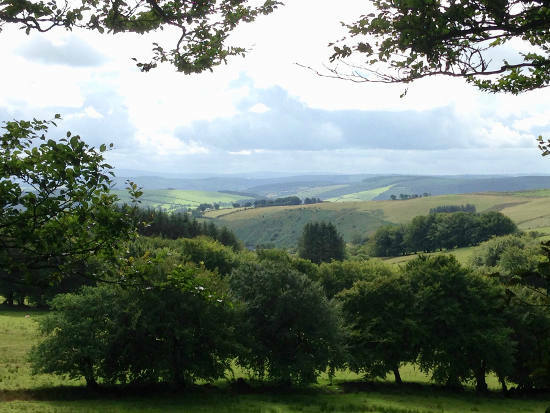 The hills and valleys at this time of year in mid-Wales are impossibily beautiful. It is a constant reminder of God's goodness and provision, for by His hand we all are fed. We are blessed beyond measure to be able to live in such glorious surroundings, and are continually thankful for this provilege we have to pray in and for this land. Another thing that never ceases to amaze and encourage us is the number of people that come from other lands to pray here in Wales, and to seek the Lord for revival in their own nations. Our friend Reg Buxton has been coming here during the summer months for about six years now. 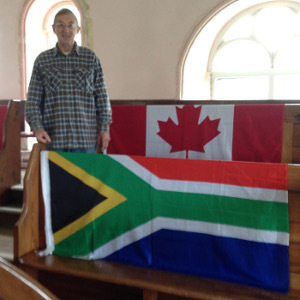 He helps with one of the local churches in a Christian kids camp, and this year he brought us a flag from his homeland, South Africa. We are delighted because we had a visit from a group of ladies from South Africa several years ago. You can read about our very special time with them in the March 24th entry at this link. We have wanted a flag from there to add to our slowly growing collection since we started it last year. On Saturday morning we had another opportunity to share with a large group of saints from Singapore. They came on a revival tour organized by our friends at Cornerstone Community Church there, who also acquired the property and re-opened the Bible College of Wales here in Swansea. We met at the well known chapel in the tiny village of Blaenannerch close to Cardigan. 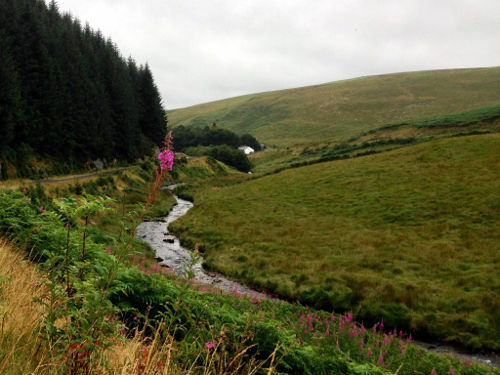 It was here that Evan Roberts of the 1904 Welsh Revival fame cried out in anguish, "Bend me, bend me..." It is always exciting to share this story how God can use an ordinary person for extraordinary things when the heart is fully surrendered. It seemed like we were able to tap into the essence of not only Evan Robert's cry, but the thousands that have come to this special place to seek God for a fresh outpouring of revival fires. Then on Sunday we drove north to a small chapel at Soar-y-Mynydd nestled in an isolated valley in mid-Wales. 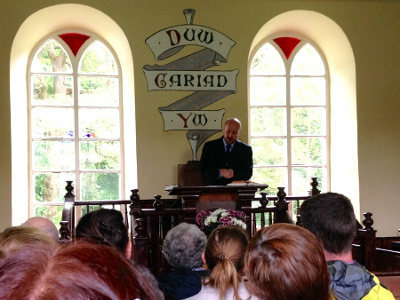 It was a nice surprise for us as well because it turned out that our friend Carwyn Arthur was preaching there that day. His wife is from Argentina, and she came with another friend from there who has been with YWAM in Northern Ireland for many years. So we had a good time with "las latinas" speaking in mostly Spanish, but Welsh and English also. It was funny to find such an international group in such an unlikely spot! We've had other international adventures here before as well. This place is important landmark. 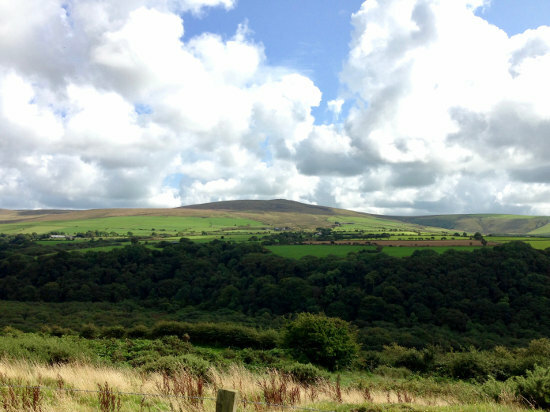 It was here "in April 1779 a revival broke out in the remote mountainous area of Soar-y-Mynydd, Cardiganshire. .. and 'numbers who had been so far hearers only became deeply concerned for their everlasting safety.' 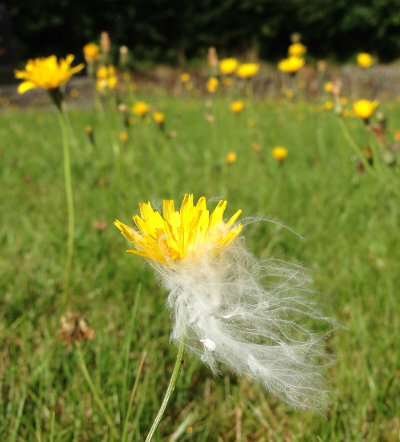 Revival spread like a brush fire out fr om here until it reached many and far-distant localities in South and North Wales, and thousands were brought to seek everlasting life." That the nations may tremble at Your presence!"